Aminda Modrell, DDS Blog ARE X-RAYS NECESSARY? X-rays are necessary for quality dental care. It is how dentists detect cavities, monitor bone level and gum health, determine the condition of your ﬁllings, crowns, bridges, root canals, and develop a baseline to monitor any changes in your oral health. X-rays catch small problems before they become big. Taking care of the problems before they generate symptoms will prevent more invasive and costly problems later on for you. 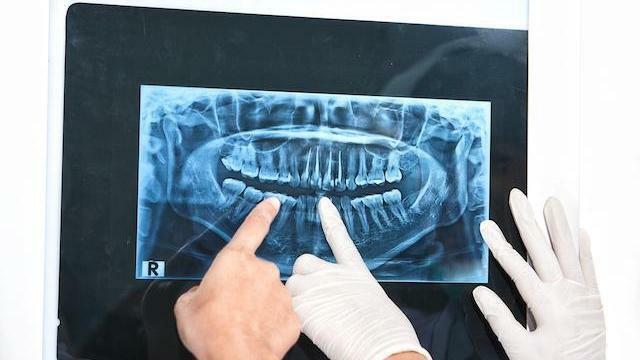 Standard of care suggests healthy dental patients have full-mouth set of x-rays taken at initial visit, then every 3-5 years, and bitewing (check-up) x-rays at least annually. This is because your teeth are used on a daily basis and restorations and the whole state of the mouth can change in a matter of days. While some may have concerns taking dental x-rays, there is surprisingly little radiation emitted compared to many common activities like ﬂying in a plane, living in a brick house, and even eating a banana! So next time your dentist wants to take an x-ray you can think this less radiation than eating bananas.